Pest Control and Exterminator Company DE, PA and MD | Termites, Bedbugs, Ants, Mosquitoes, Mice and Rats, Squirrels, Bugs etc. 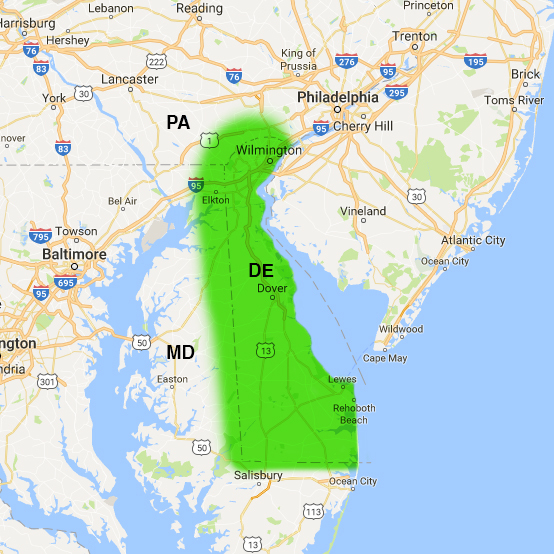 As a locally owned and operated pest control company serving Delaware, Maryland and Pennsylvania for over 30 years, we offer a vast variety of services. Our staff is always friendly, prompt and professional. We care deeply for our family of staff members and have very high retention rates which helps build lasting relationships with our customers. Our technicians are State certified and meet all technology and regulatory demands. We service customers 6 days a week and happily provide FREE estimates right over the phone. For our veteran and senior customers, we proudly offer exceptional discounts. Our scheduling is very accurate and ensures that when you need us, we are there for you. We use a systematic approach to pest control and this allows us to achieve the best results possible in the most timely manner. We care for the environment and use EPA regulated products, as well as the latest technology in the industry. Need service? Call one of our courteous office staff members today for a free estimate and to schedule your service. 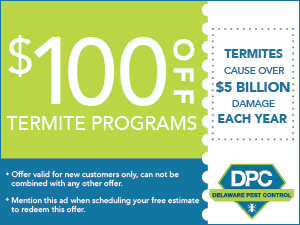 Delaware Pest Control termite service begins with an in-depth inspection of your home to target issues and conditions that enable an infestation by a variety of wood-destroying insects. 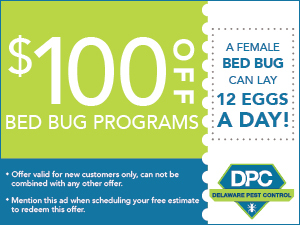 Delaware Pest Control State Certified specialists then tailor a termite treatment designed to neutralize any further infestation and damage. Think you have termites? Give us a call! I had mice and ant problems. 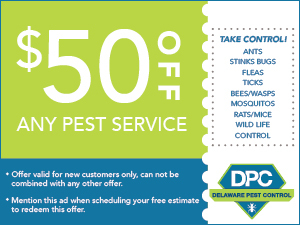 Delaware Pest Control came out and took care of the issue! Its been a few weeks now, and the problem is GONE. I was impressed how the same program that covered me for mice also covered me for ants and other insects! Would certainly recommend. See you in a few months for my maintenance program! Excellent service! Also there to answer their phones and give us a quote and time availability. Experienced, fast & professional service.